We all know that all the websites that are present on the internet have a URL. You need to use the URL of the website in order to access that website. There are times when the webmaster of the website changes the current URL to a new one due to some technical or any other reasons. This change in the URL can lead to a common error which says “This webpage has a redirect loop” in the web browser. If you are also getting this webpage has a redirect loop error it means that you are not able to connect to that website. If you are changing the URL of your website or redirecting it to a new one, some users might experience this error. The reason behind this is that Google doesn’t like this change as you are forcing the visitors to visit the new URL instead of the original URL address of the website. This leads to website redirect loop error. What is Website Redirect Loop Error? When you are redirecting a URL to a new one there should be a linear flow. There are times when things get complicated as you have performed a lot of redirections which cause the loop and then you wonder how to fix this webpage has a redirect loop. The loop which is created is an infinite one and will not allow users to go to the web address. If you are wondering how to fix this webpage has a redirect loop error then you are at the right place as there are few tricks which you can apply to fix this webpage has a redirect loop error. So, let’s have a look at all these possible methods shared below to fix this webpage has a redirect loop error in Google chrome. The methods which we are going to share will work only on Google Chrome and Mozilla Firefox. The issue is either created on the server end or the client end. If the redirection is not coming from the server side, there is a high probability that you can fix this webpage has a redirect loop error just by deleting the cookies. We all know that whenever we access any website, some cookies are stored in the web browser. These cookies will help you in logging in later on the website as it might save your login details also. 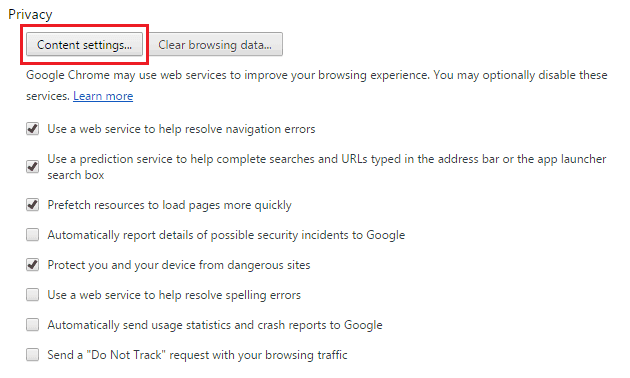 You can always clear the cookies as it will help you to fix “this webpage has a redirect loop” error in chrome. 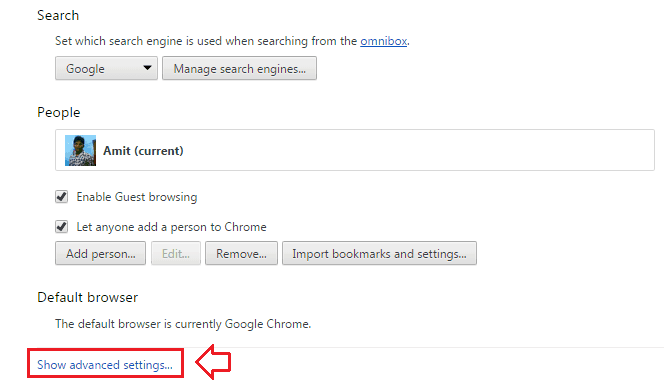 Follow the steps shared below to delete cookies in Google chrome web browser. Step (1): First of all, you have to click the menu ( ) button which is present on the top right corner of the browser and select the Settings option. Step (2): After that click on “show advanced settings…” links to see the various settings. Step (3): Now under the Privacy section, click on “content settings…” button. 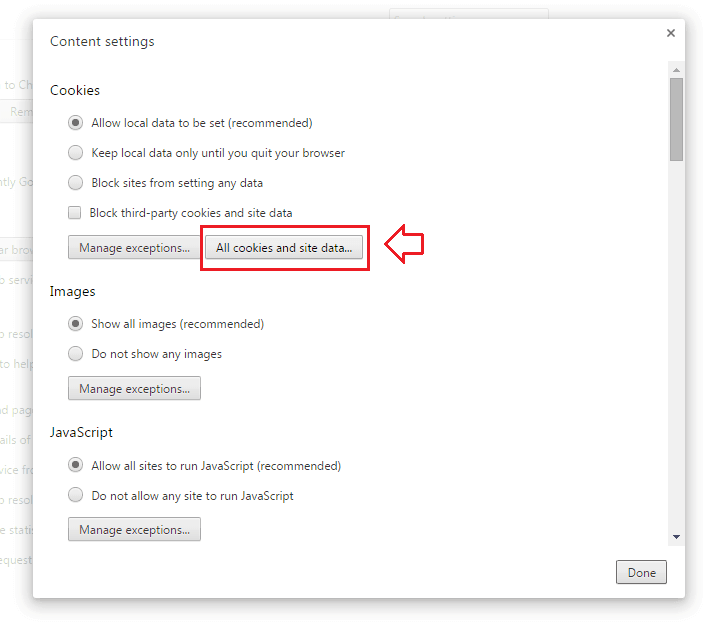 Step (4): From the Content settings dialog box, click on All Cookies and site data… button. Step (5): Just after the click, you will be able to see the complete list of Cookies and site data. Step (6): You have to simply click on “Remove all” button and then Done. That’s all! Now you have to close the browser and then open it again. You should have fix this webpage has a redirect loop error. If you have deleted the cookies and you are still getting this error then you need to check the .htaccess file. The .htaccess file is present in the file Manager of your website. To fix “this webpage has a redirect loop” error in chrome by checking the .htaccess file you have to find for any loops or redirection codes if present in the .htacess file. If there are any codes present remove them and try to make it clean. This will help you to solve the issue. Thus, you can see how simple is to fix “this webpage has a redirect loop” error in chrome. Apply these above explained methods in order to solve this web page has a redirect loop issue on your browsers. We hope that our guide of how to fix error this webpage has a redirect loop in chrome has helped you in fixing the error. Please, feel free to let us know using the comments section below – Out of the above two methods, which method helped you in fixing the error “this webpage has a redirect loop” aka Error 310 (net::ERR_TOO_MANY_REDIRECTS): there were too many redirects?